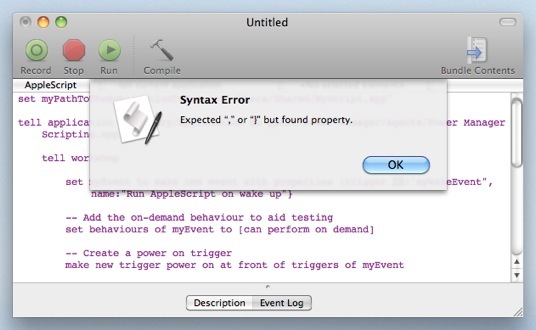 This article shows how to fix AppleScript Editor's Syntax Error with the message "Expected "," or "}" but found property." AppleScript Editor needs to find and read the terminology dictionary of the application being scripted. If the application can not be found, the unhelpful Syntax Error will appear. tell application "/Library/Application Support/Power Manager/Agents/Power Manager Scripting.app"
Launch Power Manager Scripting in the Finder. The first time Power Manager Scripting is launched, the Finder will register the application's location with Launch Services. Launch Services can then help other applications, including AppleScript Editor, find the application. If the error continues after you have tried these fixes, the AppleScript may actually contain a real syntax error. This article was posted in AppleScript, and Power Manager and tagged AppleScript, Power Manager Scripting, and syntax error.